"God's Not Dead 2" shines a light on the religious freedom battles being waged across the country that many Americans are not aware of. Using a similar formula as the first film, the creators of "God's Not Dead 2" move from scientific proof of God's existence to evaluating historical proof of Jesus' life on Earth. Having a female lead this time around, '90s icon Melissa Joan Hart ("Sabrina the Teenage Witch," "Melissa & Joey") takes on one of her most dramatic roles to date and brings the plot home with her convincing performance of persecuted teacher Grace Wesley. When not looking after her grandpa, Walter (Pat Boone), Wesley spends most of her time in the classroom teaching high school history. But one day her answer to a student's question about Jesus' teachings compared to Gandhi's ideology, lands the happy-go-lucky teacher in court. "God's Not Dead 2" takes viewers on a journey of one student's discovery of faith at the expense of having to fight for religious freedom for her teacher. The plot unfolds as Wesley is forced to prove the historical validity of Jesus Christ while placed on trial for her faith. All of the main characters are new additions to the franchise. Joining Hart is Jesse Metcalfe, who plays her defense attorney Tom Endler, and Hayley Orrantia, the atheist-turned-believer student, Brooke Thawley. Returning to part 2 are Pastor Dave (David A.R. White); his friend from Africa pastor Kane, who continue to add humor to the film; Miss Ryan, the reporter whose battle with cancer led to her odd friendship with the NewsBoys, who also return to part two; and Martin Yip, the foreign exchange student who comes to faith in part one and continues his pursuit. The highly-anticipated sequel hits theaters April 1 on Atheist Day, which the studio says happens to be a coincidence. In the film, Wesley's rookie lawyer is admittedly a non-believer, and on the other bench is Pete Kane, the rage-filled lawyer who represents the atheist parents of her student. Ray Wise' character, Kane, makes it his priority to fight what he calls Wesley's "repressive belief system" of Christianity in hopes to prove "once and for all that God is dead." A line in the film spoken by Wesley's grandfather in the midst of the vicious court proceedings makes a bold statement about atheism: "That's the thing about atheism, it doesn't take away the pain, it takes away the hope." Other social topics addressed in the film are non-violent protests, as the students fight for religious tolerance for their teacher; the persecution of Christian converts, as Yip's character is disowned by his father for becoming a Christian; and pastors having to submit their sermons to the government for review. Throughout the movie, Hart is seen reading, quoting scripture and praying. When threatened to be put on disciplinary suspension, she refuses to apologize and says one of the most powerful lines of the film: "I would rather stand with God and be judged by the world, than stand with the world and be judged by God. I will not be afraid to say the name of Jesus." Perhaps the greatest compelling argument for Jesus in the film is when The Case for Christ author Lee Strobel and former homicide detective J. Warner Wallace, author of Cold Case Christianity, both testify on the stand to the historical validity of Christ. Both men indisputably prove that Christ and His Word are proven history and every famous historian, both Christian and non-Christian, agree that Jesus existed. As the film comes to a climax and it appears all is lost, Hart gives her most incredible performance of the motion picture. The actress brings the story to life with her raw emotions of feeling victimized while enduring the battle. Her tears, resilience and example of how to stick to your convictions yet let God peacefully fight your battle is the championing theme of the film. Quotes like "the teacher is always quiet during the test," gives viewers enough strength to keep on keepin' on in their own battles of life while watching Wesley fight hers. The film also includes the hymn, "How Great Thou Art," and a Newsboys performance of their new song, "Guilty." Featuring historical proof that Jesus existed, "God's Not Dead 2" reveals that the wisdom found in the Bible continues to be an effective resource to helping Christians overcome life's biggest challenges in the modern world. Wesley's world was "colored by her faith" and she stood up for what she believes in spite of the pressure. Her faith inadvertently affected all those around her even in the courtroom. A quote spoken by her lawyer sums it all up best: "They wanted to make you an example but instead you became an inspiration." 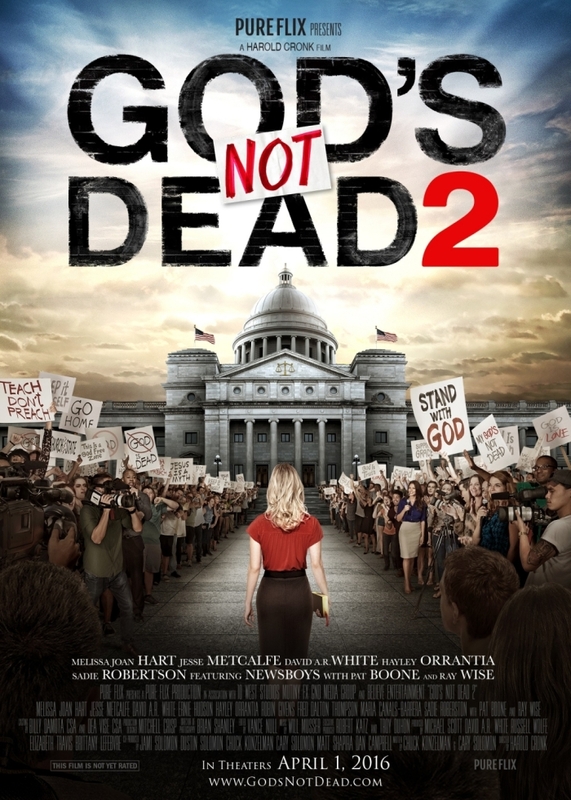 "God's Not Dead 2" hits theaters April 1, and at the end, at least 50 real-life court cases in which the plot of the movie was based on is presented. Be sure to stick around after the credits roll, there's a hidden scene hinting at a "God's Not Dead" part 3.